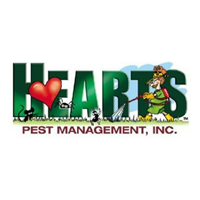 Hearts Pest Management is professional & sets the customer’s needs first! Great experience and problem solved! Have already referred them to friends and family...thanks so much for your awesome help! Great service!! Highly recommend this company. One spray and no more ants!!! Prompt service and no smell or residue behind. I used the green service for a spider problem in our home and am happy to say I haven't seen one since day 2 of having them come out here. Finally peace of mind as I have small pets and children I didn't want to expose to unnecessary toxins. Great service and products! we had a great experience with Duc! Technician was knowledgeable and well mannered. All of your employees who visit (Ryan I think has come most recently) have consistently been polite, informative and thorough. Today my dog found a sort of dried up rat-- it had sparse hair on it and one side was whitish. Is this normal with the poisons they are eating? Is there anything harmful to my dog? Thanks. Roxanne Young. Heart’s Pest Management is really awesome. Their system of reminders is very helpful. We like to make sure our furniture is overturned. That would be easy to forget if we only got one reminder. They give a lot. Duc is always very pleasant and helpful. Thank you!!! Our on site tech is 5 stars but the office workers need training in customer service. They can't get my service on from bi monthly to monthly and are rude. Too many people answering phones that are not trained. Very knowledgeable on plants, pests and remedies. Duke was very knowledgeable about products & very courteous. Super personable. They go out of their way to work with your schedule and be responsive. Honestly, this company could be a perfect benchmark model for customer service. I recommend harts pest management. they don't use scary poisons around your home and whatever they use it seems to be working. Doc comes quarterly and always does a good job. I had an ant problem some months back, and he promptly came by, treated the area and alleviated the problem. Your employee, Seff, was very personable and a great representative of your company. I appreciated his easy nature, and frank advice. He is an asset to your company. Duc, was very nice and very helpful. I anticipate us doing business together in the future. Doc was very helpful and spent time with me answering questions. Great customer service! Thank you! I actually get Organic service not Green, but Duc let me know at this time the Green will be better due to ants . I appreciate his helpful recommendations. tech arrived within timeframe scheduled - phoned when he was on his way. straightforward in his inspection & recommendation. He was very helpful and answered our questions. He put our fears to rest that brown widows had actually been in our home, as the spiders I had seen did not match the right description. This was helpful! Duc was really great! His recommendations were very helpful and he gave great insight. Pretty incredible. Our tech is the kind, knowledgeable and professional. He let me know what we needed and tried to make certain my green needs were met. Duc is very knowledgable and thorough. He communicates well regarding problem areas and he is interested in getting the job done properly. The main purpose for using your services was to get rid of Velvety Tree ants, in the yard and in the attic. The first visit was very well handled and over time the ants disappeared. Subsequent visits were okay, except for today's, which according to my wife was handled by a somewhat distressed person and she had to direct him in the job. Duc is the best! He always goes above and beyond. Hearts initial visit was great. Duc Phan is very professional, answered all my questions, explaimed my options, applied the treatment I wanted, made no mess, and worked in a timely manner. Duc is always friendly and professional. So far it's been great! I've found the company to be very responsive to my concerns. I can't vouch entirely on this experience as I'm not at home usually when they come, but it seems to be working! I'm not running into webs everywhere I walk in my backyard and around the house! Thank you. I am so impressed with the level of serviced that I received from Hearts Pest Mgmt! Duc was the technician who did the service, and he was personable, thorough, and even removed the webs from my outside eaves! I really feel like I got my money's worth! Duc is always in good spirits and makes his visit that more pleasant. Duc is always awesome and simply takes great care of us :)!!! Did a very good job. Pleasant technician who explained things well. Duc was very professional and enjoyable to deal with. I will of course refer your company to my friends. Great communication, very polite and courteous. Thanks guys! The technician was great. Knew what he was doing and pleasant to deal with.